Location: At the end of a former (now blocked to vehicles) public road. Present state: Demolished, nothing remains. Notes: Although the line opened in 1849 Annesley Station wasn 't opened until 1874 primarily to serve and increasing local populations since the opening of Annesley Colliery in 1865. he colliery was provided with its own private staff platform Annesley Colliery Sidings Platform which opened south of Annesley Station on 1st January 1882. 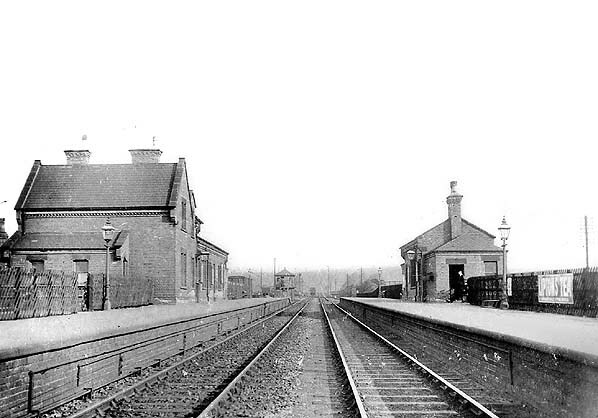 The main station building was on the up side of the line at the end of a a 1/4 mile long approach road from Annesley village. Annesley was an early causality losing its passenger and freight service on 6th April 1953 although e private sidings remained open after that date. The Midland proposed a line between Mansfield and Worksop in November 1860 but the Dukes of Newcastle and Portland disagreed on the proposed line and the project was abandoned. between Mansfield and Worksop; initially the trains ran through to Retford but the service was eventually cut back to Worksop. The passenger service consisted of three Midland Railway trains between Mansfield and Worksop with a journey time of 40 minutes and three Manchester Sheffield & Lincolnshire trains between Mansfield and Sheffield with a journey time of 75 minutes. With the opening of the new line, Worksop became a junction with a through service from Nottingham being introduced. open for freight traffic between Nottingham and Newstead Colliery. The 'Robin Hood Line' reopened in stages between 1993-1998. The bulk of the line re-used the former Midland Railway route from Nottingham London Road to Worksop. 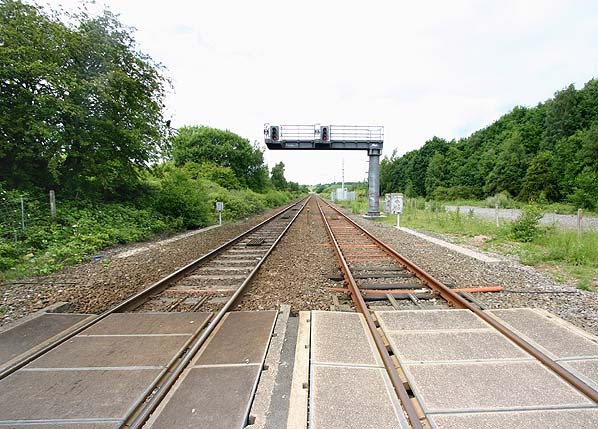 However, to keep the costs of the re-opening as low as possible existing track was used wherever possible. From Worksop, the line followed the old Midland route as far as Sutton-in-Ashfield but between Sutton-in-Ashfield and Kirkby-in-Ashfield, the line was diverted to join the former Great Northern Railway route through the area. This had allowed British Rail to sell land right in the centre of Kirkby-in-Ashfield whilst keeping a route through the town. After crossing the town on the GNR route, the line re-joined the old MR route, where it remained as a freight line to Pye Bridge, near Ironville. When plans for the Robin Hood Line were drawn up, it was decided to stay with the GNR route through Kirkby-in-Ashfield then swing south-east via Kirkby South Junction onto the former Great Central Railway main line from Manchester to London. After briefly following the GCR, the line then climbed to re-join the Midland route to Nottingham, to allow reconnection at Newstead. The new line from Nottingham to Newstead opened in 1993, although Bulwell station didn't open until 1994. It was extended to Mansfield Woodhouse in 1995, with Kirkby-in-Ashfield station opening in 1996. The through passenger route from Nottingham to Worksop opened in 1998. Since then the section between Bulwell and Hucknall has been converted from double track to single track to allow space for the new Nottingham Express Transit tramway, which follows the route as far north as Hucknall. The tramway opened in March 2004.
and Worksop were reopened with the exception of Linby and Annesley both of which served adjacent collieries. Linby Colliery closed in 1988 and although Annesley Colliery remained open until 2000, Newstead Station was close by and it was unnecessary to reopen both stations.